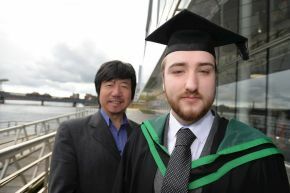 Ulster University graduate, Jordan Vincent, has been awarded a first class honours degree in computer science and will now embark on PhD research with the aim of transforming quality control within the food processing industry. Jordan, from Newtownbreda, began his research as part of his undergraduate course focusing on the use of sensor technology known as infra-red spectroscopy (NIRS) and its potential to accurately identify food substances without damaging the product. Speaking about his research, Jordan said: "The research aims to create a method that is more accurate than image processing and less time intensive than manual testing to assess quality during the food manufacturing process. "Image processing technology can be used to tell for example apples from oranges, however if you paint an apple with orange paint the image processing is likely to tell you incorrectly that it is an orange. The NIRS technology however would identify the paint and report it as an altered apple. "The type of NIRS technology used has the advantage of being non-invasive so it doesn't damage what it's testing in any way. If it can tell the difference between a good apple and a bad one the non-invasive nature would make it possible to test everything leaving the food production line. This could be done quickly and cheaply compared to the most common method of taking a small sample from each batch. "With smaller and more portable sensors, there is the potential to use the technology to tell different organic items apart without a focus on how it looks. For example it could help to identify mushrooms that are safe to eat versus poisonous mushrooms – something that is currently very difficult to do as they can look almost identical. NIRS has the potential to do this accurately and I look forward to exploring its potential further. "My initial research as part of my degree delivered some promising results and with encouragement from my supervisor I decided to take it to the next level and undertake a PhD. I am really interested in both physics and artificial intelligence, and this further study will allow me to combine both these interests in a way that has real world applications."